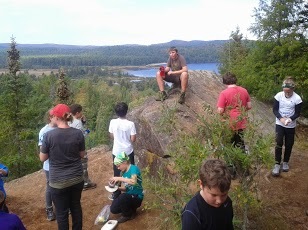 Recently I had the opportunity to participate in a 4 day backpacking excursion with sixteen 12 year old students. We started out with ideal fall weather, cool nights and daytime temperatures in the low 20’s. Being outfitted for 4 days of backpacking is more challenging than a walk in the park. You can’t go 4 days unless you have a good supply of food, tents, water purifying equipment, rain gear etc. Preparing young students for living in today’s society requires educational experiences that go beyond the walls of the classroom. Bringing 16 young students away from the supports of home requires them to make some adjustments. Being away from running water, away from ready cooked meals, away from clean drinking water on demand, away from a house that protects them from the elements, creates some memorable learning opportunities. On a more superficial level, though no less important, the backpacking trip creates an opportunity to learn skills such as fire building, basic first aid, packing and fitting a backpack, orienteering and map reading. While these would be considered survival skills, they could probably be taught equally well in a classroom. However, when some of these skills are taught ‘in the field’ they take on a greater urgency when it is on a ‘need to know’ basis (though we hope it doesn’t come to that). The first evening was an interesting situation. The students were sitting around the campfire pit, talking and laughing. However, it was approaching supper time and no one was making a move to gather firewood and get a cooking fire started. On the urging of one of the adults to get firewood and what was needed for kindling an interesting thing happened. Two students stood up to begin gathering firewood. The other eight students just sat there. They seemed to expect that the camp fire thing would somehow happen. Only after a very pointed instruction that everyone needed to help get firewood, did the rest of the students get up and being the job of gathering. A similar lesson needed to be learned for preparing for cooking, getting the bear bag ready for the night, setting up tents, putting backpacks away so personal effects wouldn’t get rained on, taking down and packing the tents in the morning and so on. The students gradually began to realize the importance of planning ahead, seeing what they could do to contribute to their own needs and to the needs of the whole group. The goal was to bring the students to the undertanding that they needed to initiate the next step. The students needed to come to the point of realizing that an adult, whether a parent or someone else, wasn’t going to necessarily tell them what needed to be done. Part of the learning process was having a couple of student leaders assigned each day to take charge. The student leaders would be briefed on what needed to be done that day. It was then their job to organize what needed to be done and then delegate the various tasks to the other students. The student leaders were faced with a number of challenges, the least of which might have been getting fellow students to follow through on what they were asked to do. The backpacking experience offers opportunities to create object lessons. Students were reminded to distribute the food and cooking utensils when they were packing up so that the load would be distributed evenly. One day, after asking students whether this was happening, we asked all the students to line up, drop their packs, take a step forward and pick up their neighbour’s pack. The next 20 minutes of hiking was an eye opener for some of the students. In taking a group of young students on a hiking excursion there are some interesting observations that can be gleaned. 1. Empowerment: There are skills one would expect a 12 year old to have mastered. When the opportunities to learn those skills are taken away from them there is a learned helplessness. It might be more efficient for an adult to do a particular task, but what is lost is the opportunity for a student to learn a new skill. What is lost is the opportunity to empower a child. 2. Contributing: At age 12, children are capable and in a position to make valuable contributions. Through words of encouragement students begin to realize and appreciate the difference they can make when they contribute to the needs of a group. 3. Empathy: Learning to recognize the need to lend a hand or help someone comes from learning to observe what is happening. From there developing a sense of empathy and understanding leads to specific actions. 4. Accomplishment: It is interesting to watch a student struggle with their pack over a four day period. In that time suggestions were made on how to balance a pack or make adjustments on the straps. However, when the same student was met on the trail by another adult who offered to carry the pack, the student chose to complete the last kilometer of the hike carrying his full pack. The sense of accomplishment was clearly evident. Poverty relates to a loss of community and each person’s place and role. The experience of a four day backpacking trip helps students experience a variety of elements that makes for a community. When all they have to depend on for 4 days is each other, some real learning and growth begins to happen.